The opportunity to make money on social is quickly being embraced by sales teams who are eager to incorporate social selling into their sales tactics. While this excitement around a new method of selling is great, diving in headfirst can be dangerous if you don’t understand what social selling really is, or what outcome you are looking to achieve. Currently, most social selling tactics for sales representatives are manual. They spend time trying to identify the right leads on social channels, assessing if they are a qualified lead, and then engaging with them. They think, “Sell first, and act on social second,” which is a backwards tactic. 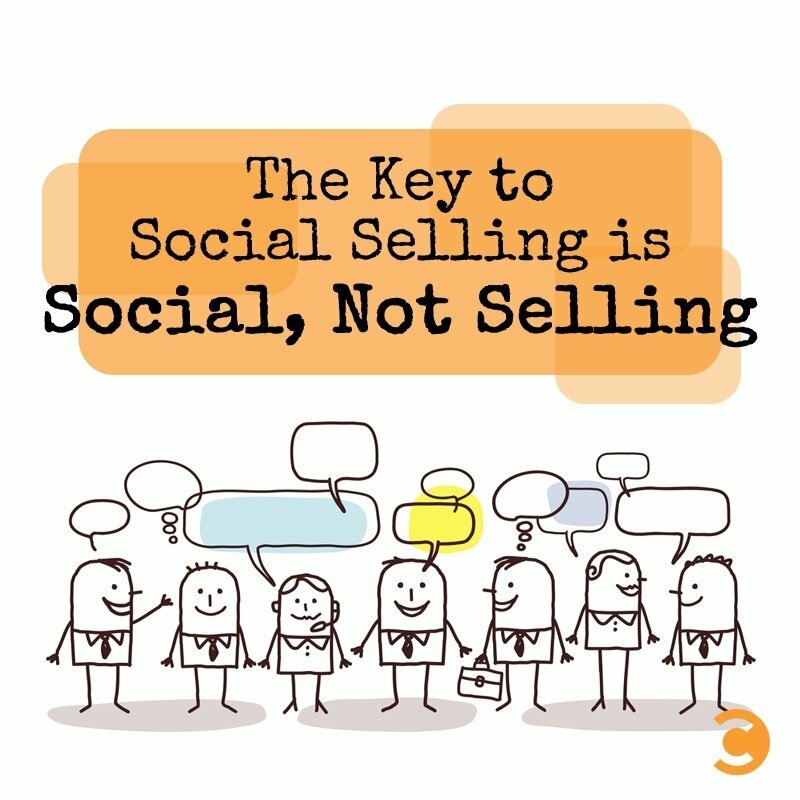 It’s called social selling because it’s about connecting socially first (as you would during a trade show, dinner meeting, or at the bar) and selling second. Here are a few ways to connect social and selling in the most effective way. Figure out what outcome you want the social connection to have first, then work backwards. This could be a meeting, connecting only with CMOs in retail, engaging a thought leader, etc. Discovering your desired outcome will give you a starting point around building your entire social selling strategy. After figuring out the outcome you hope to achieve, you can move to identifying the “who”—the group of individuals you are looking to target. Start by creating social media filters using keywords and phrases to identify who is talking about the category of products or services you are trying to sell. You could also look for prospects who have a negative view of your competitors’ products or services, or a positive inquiry about yours. Throw out a wide net with the objective of catching as many prospects as possible. After casting a wide net, you need to separate the qualified from the unqualified. Simply getting a Twitter handle or Facebook profile is only one piece of the process. The next step is to create an extended profile for each lead, wherever possible. You can do a far better job of segmenting and targeting your leads if you have as much information about them as possible. Your leads share a lot of information on social channels—make sure you are taking advantage of this information, and then use it to target specific people and drive conversations. The struggle for many sales representatives is not having enough relevant information about their leads. A more targeted profile helps you analyze lead behavior and patterns. What are the top topics the lead interacts with? What hashtags have they used most frequently in the last 30 days? This next step helps your team better understand the segmentation and targeting, so when the call, tweet, or email is made, you are better equipped to start a conversation that is engaging and thought-provoking. Once you have identified and analyzed the targets, how do you know which prospects are the most relevant? The next step is scoring. Just as with traditional drip email marketing systems, you can score your leads on demographic and behavioral attributes. The main difference is that, in this case, the attributes are based on information that is publicly available from social profiles and interactions, such as tweets and posts. Let’s stop for a second and talk about the first part of the equation: social. Since social channels are connected to real people in the real world, the conversations should be sincere and authentic. When connecting with thought leaders and individuals, it’s about developing the relationship first. Similar to traditional drip marketing campaigns, you should set up drip campaigns on social channels to nurture the leads you have started conversations with already or identified as potential prospects. It is important to do this at scale while personalizing the context to the furthest extent possible. This can be done manually or using a Social Relationship Intelligence Platform like Insightpool. Once you have nurtured the lead at scale, inside sales can use the context of the nurture to further qualify and turn it over to outside sales as appropriate. The insights gathered over the entire journey, including lead level analytics, will help sales have a more meaningful conversation and close the deal faster. The goal of social selling is equipping your sales team with another platform to drive revenue and results. Newly created sales leads captured on social channels should be tagged in your CRM so you can track their progress through the entire sales funnel. This will help you attribute revenue to your social efforts and calculate revenue and results.